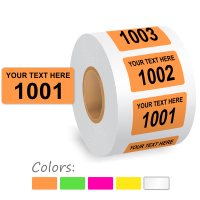 Customize your consecutive numbered labels by adding one line of text and choosing a color scheme. We also offer options to add barcode instead of sequential numbering. Brilliant fluorescent paper. 4 mil thick (w/o liner). Affordable, and great for temporary, indoor applications. Write on labels with a pencil, marker, or ballpoint pen. Digitally printed in black, and FSC certified.